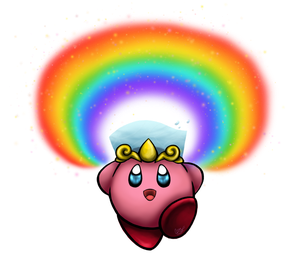 This is Kirby cosplayed as Isaac from Golden Sun series with Earth (Venus) power for a special charity again! 's spread the word and makes a difference! 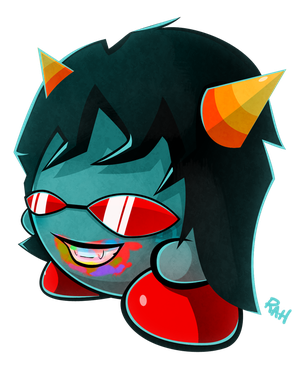 Hello there my fellow deviants! I bring you the next collab theme! This collab was the first collab I ever ran and I was overwhelmed to have 166 people!! I was a Gallery Moderator (Community Volunteer) at the time and tried lots of failed experiments with the community. 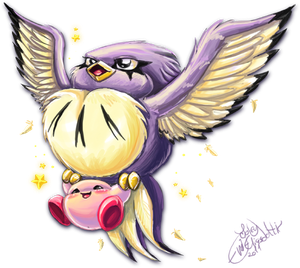 When I failed all those times I learned more what the community likes and then came up with the idea to draw Kirbies to celebrate their 20th anniversary! I would like to walk back in time and draw Kirby again for charity!! Examples from the First Collab!! Did ya see the potential Golden Sun teaser screenshot for SSBU? Oh my god! It's so cuuuuuute! Thanks for the Llama, by the way. I love the detailed work in this one! i actually thought that guy was Cloud from FF7 because of the...spiky hair. The juxtaposition of texture and cute style here is fantastic! okay everyone last day to vote for Issac from golden sun on the smash ballot okay? so get those votes in for Issac okay? yes what he said and if you are a golden sun or just like Issac from golden sun then please vote for him and spread the word on voting for Issac as best you can do and on how much you can in the short amount of time you can or have okay? lets get Issac that last push he needs for him to win okay? so go my friends and spread the word around okay? Thankies, yay! So small but SO strong!! 8D' No problemo, it was a pleasure! "^"
Thanks again <3 And if you like join the action too! Hehe, thankies! :3 If you like join the action again, mate! Yup! Just got mine up today. Can I have all my YES on this with a side of WANT? 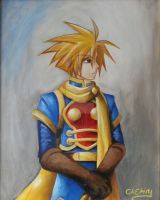 This makes me wish they would bring Isaac to Smash Bros. Maybe next time when they finally release Golden Sun 4. All GS fans hope for it! There, now it's spelled right! This is such an adorable version of chibi Isaac, Neshi! I love it! Aww, it looks so adorable! Great work as always Nesh! UGH, I just love all the colors you use I swear!